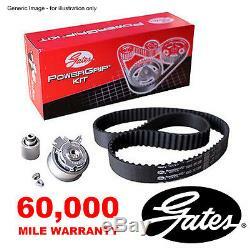 Genuine Gates Timing Belt Kit. 1x PowerGrip Belt (5569XS), 1x Tensioner Pulley (T43091), 1x Guide Pulley (T41229), 1x PowerGrip Kit Accessories (SET 24), 1x Installation instructions (I-COMBI07). GATES: 5569XS, GATES: T41229, GATES: T43091, AUDI: 038198119A, SEAT: 038198119A, SKODA: 038198119A, SKODA: 038198119C, VW: 038198119A, VW: 038198119C, VW: 038198119G, BOSCH: 1 987 948 007, BOSCH: 1 987 948 253, CONTITECH: CT1028K3, DAYCO: KTB296, FAI AutoParts: TBK345, FEBI BILSTEIN: 21724, FLENNOR: F914458V, FLENNOR: F944458V, HUTCHINSON: KH 194, INA: 530 0201 09, INA: 530 0201 10, INA: 530 0201 31, OPTIBELT: KT 1237, QUINTON HAZELL: QBK625, ROULUNDS RUBBER: RR1107K3, RUVILLE: 5573950, RUVILLE: 5573970, RUVILLE: 55739702, SKF: VKMA 01250, SNR: KD457.49, SWAG: 30 92 1724, TRISCAN: 8647 29048, UNIPART: GKT5569XS, VEYANCE: K5G1543H. We have put as much detail as possible in the part compatibility table above, but the only way to be 100% sure that the part will fit your vehicle is to check the part number on your original unit - If you find that the part isn't right for you for any reason send us a message and we will be happy to arrange a return. 2 Year (Up to 60,000 Miles) Guarantee. All of our products are brand new and genuine. We have very good relationships with some of the biggest part manufacturers in the world meaning we can offer huge discounts compared to a traditional motor factors. If a part is faulty a replacement will be sent out after the return and testing of the old unit. Labour claims are never accepted. We deliver worldwide and have high profile customers based in Europe, USA and Australia. The item "GATES TIMING CAM BELT CAMBELT K055569XS FOR AUDI A2 A3 A4 A6" is in sale since Tuesday, August 30, 2016. This item is in the category "Vehicle Parts & Accessories\Car Parts\Engines & Engine Parts\Belts". The seller is "cponline15" and is located in PR6 0LP. This item can be shipped worldwide.